A Reggio-inspired classroom is one that has adopted the core values and beliefs of the Reggio Emilia approach. These values include the image of the child, emergent curriculum, project work, the role of the teacher, the role of the environment, parental involvement, and documentation. Each child is seen as a strong, capable, independent, and curious being. Children should always be encouraged to think, explore, investigate, and question the world around them. Through observation of interactions, a learning experiences curriculum can be created based on each child’s interests and ideas. Project work is important in allowing children to explore their interests and build on basic ideas and concepts. The role of the teacher is to be a partner in learning, while the role of the environment is to act like a “third teacher”. The environment should represent the children and most importantly, respect the image of the child. Since learning takes place in all aspects of a child’s day, parental involvement is a crucial value in this philosophy. Additionally, documentation ties all of the values together by enabling a story to be told of a child’s early childhood experiences and milestones. Displaying work, lessons, and projects can also create a sense of community and pride. Most parents and educators have noticed how magical lights and shadows are to children. Whether it is on walk outside where children are chasing their shadows, or using flashlights and blocks inside on a rainy day to create a story on the wall, a child’s creativity and imagination with shadow and light is endless. 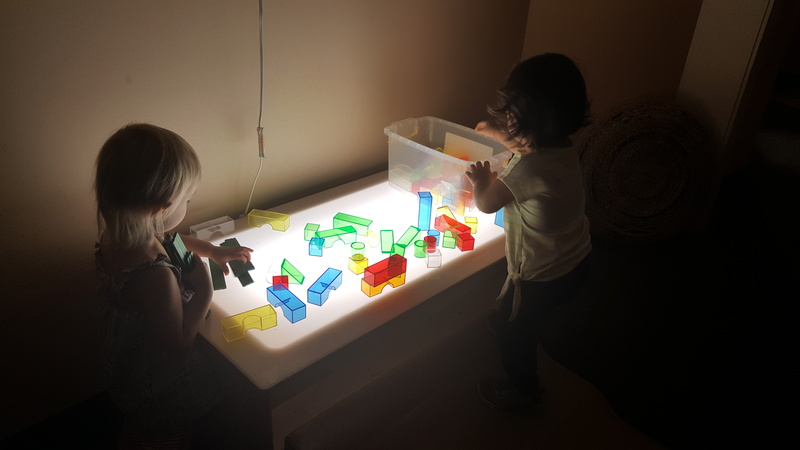 The Reggio-inspired approach strongly values using light as a material to help support active exploration and discovery. When setting up a light and shadow activity or project for children, it is important to begin by questioning children about the topic of interest. Understanding a child’s background knowledge of the topic and their interest level is key in creating an engaging activity. It is important to provide a number of materials and a setting that is appealing to the children and that works for the specific activity. Additionally, parents and educators should take a step back and observe, not teach the children. Listening to what questions the children ask and key statements they make will help with extension activities. There are many great ways for children to use light and shadow play. A wonderful way to practice fine motor skills with shadows involves using a projector light or other light source to create shadows of the child’s hands on a wall. Children can work on finger isolation, thumb opposition, and other hand positions using shadows. Another fun games are “Shadow Simon Says” or “Follow the Leader” where you can use whatever light source that’s available. A leader is chosen and the other children are encouraged to watch the leader’s shadow and follow along with his or her movements. Shining light through Magna-Tiles and colorful water blocks. Children can create colorful images and overlap colors to create new ones. 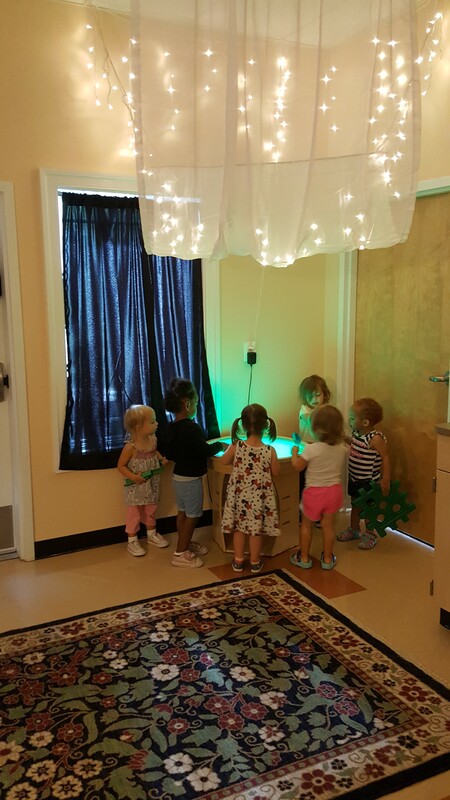 Light and shadow play is an amazing way for children to explore the world around them and it can easily be accomplished in the classroom or at home. See what happens on the next sunny day when your child steps outside on the sidewalk. Hand your child a flashlight and watch their imagination soar! For more information about the values found in a Reggio-inspired classroom, visit The Compass School.